The Ramirez FL2 flamenco blanca is a traditional Flamenco Blanca model, built to provide brilliant, percussive and loud rhythms at brisk tempos. This model, and its new replacement the Estudio Flamenco are the only ‘Student’ Flamenco guitars offered by Ramirez. Flamenco is now very professional and formalized, but at its roots a folk style combining highly expressive, rhythmic percussion and melody using voice, dance, hand claps, finger snaps and guitars. Some drum type instruments, particularly the Cajon, are now also used. It is one of the most exciting music forms to see live, and always provides a good reason to take a trip to Spain. 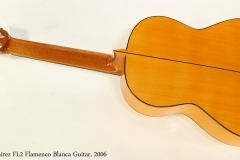 Flamenco Blanca guitars feature lightweight construction and use of Spruce for the top, Cypress for the back and sides, and Spanish Cedar for the neck. The fingerboard is Ebony, with Palisandro or Rosewood for the head plate and bridge. Flamenco Negra models use Palisandro, or Rosewood for the back and sides, and have a slightly warmer tone. In all cases, the geometry of the Flamenco model differs from Classical models in that the neck angle is designed to provide low action. This is partly to allow and encourage the typically enthusiastically fast playing, and partly because the resurattling of the strings against the frets is an essential part of the tone. 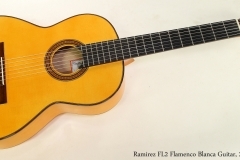 This Ramirez FL2 Flamenco Blanca model dates to 2006 and is in very good condition, with only light wear and one small pressure mark on the top. The finish is very clean and fret wear is negligible. It does have tap plates installed, so the top is largely protected. The FL2 has been superceded by the Estudio Flamenco model, and the replacement model currently has a retail price of around $3800 Canadian. This older model is a very good deal! The original Ramirez hard shell arched top case is included.